Poles rally against controversial reform of judiciary – Royal Times of Nigeria. 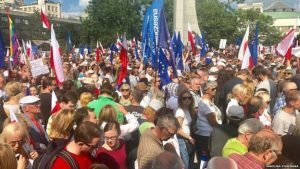 Thousands of Poles have gathered outside parliament in the capital Warsaw to condemn a controversial reform of the judiciary. Protesters say the bill, passed by the Senate on Saturday, will erode judges’ independence and undermine democracy. It gives MPs and the justice minister the power to appoint judges without consulting judicial circles. The government says the move is needed because the judiciary is corrupt and serves only the interests of elites. The bill must still be signed by President Andrzej Duda in order to become law. He has given no indication that he plans to veto it. Since it came to power in 2015, the government of the conservative, populist Law and Justice party (PiS), has passed a series of controversial reforms, triggering mass protests. Opposition leaders like former Foreign Minister Grzegorz Schetyna of Civic Platform and Ryszard Petru of the Modern party took to the stage to address it. Mr Schetyna had earlier likened the reform to a “coup”.